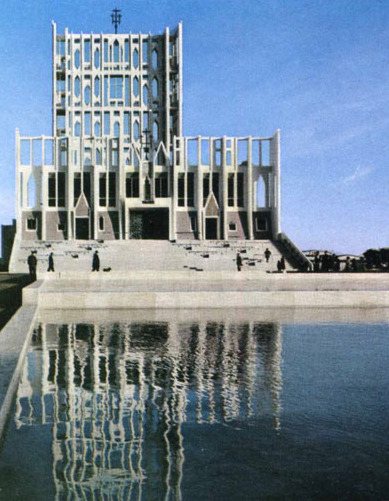 Blue of spirit and calm: The Gio Ponti cathedral in Taranto was conceived in 1970 as an ode to humanity. Ponti placed his architecture in the service of faith, where all the elements of nature would participate. The sky, water, clouds, geometry, “even the angels”, as the architect used to say. Pale blue is a calming color. The Zegna invitation to the men’s show this year has been the most beautiful, with the blue of peace and its architectural severity. 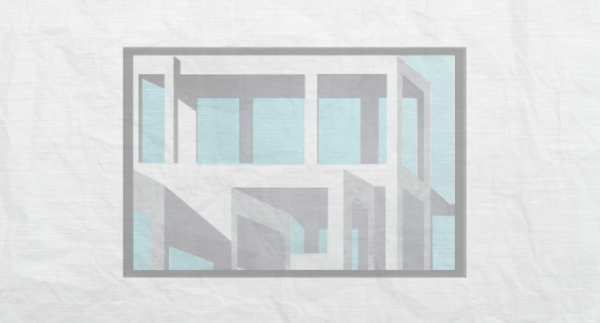 It reminds me how important architecture is in our lives and is perfect with fashion shapes of this collection. Here, blue is the color of high ideals. 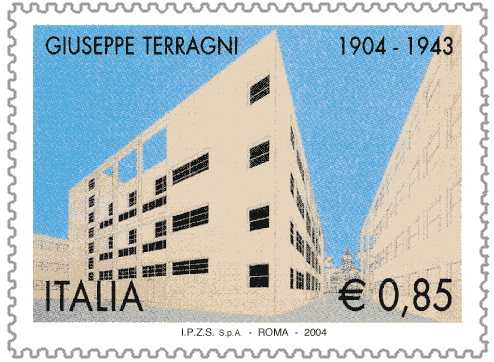 Giuseppe Terragni worked for only 13 years, but created buildings of such great strength that Italy honored his work with a stamp on his 100 year anniversary of birth 1904–1943. He died before his greatest project, the Danteum, to honor Dante and the Divine Comedy, could be built. Milano owes him a lot. Blue can give a feeling of distance. This week it seems that “everybody” is in Basel enjoying the art fair and the beautiful building by Herzog & de Meuron in 2013 for Messe Basel, with the striking huge hole that breaks through the new hall and brings the blue sky light to the space. Blue is the color of water – and swimming pools. 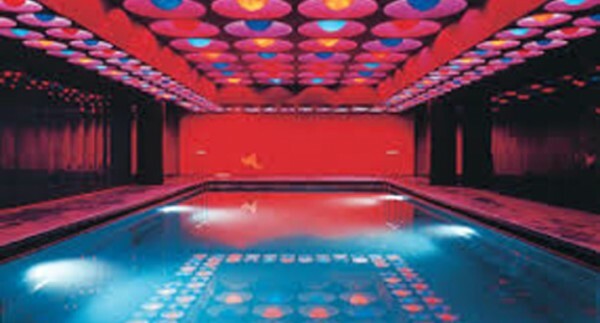 But Verner Panton changed the rules with his swimming pool in 1969 in Hamburg, Germany, installed for the employees of Spiegel publishing House! Known perhaps more for his “’60’s” bright plastic furniture that is still in production, Panton added his typical fusion elements to this interior. Unfortunately the swimming pool was destroyed by fire. 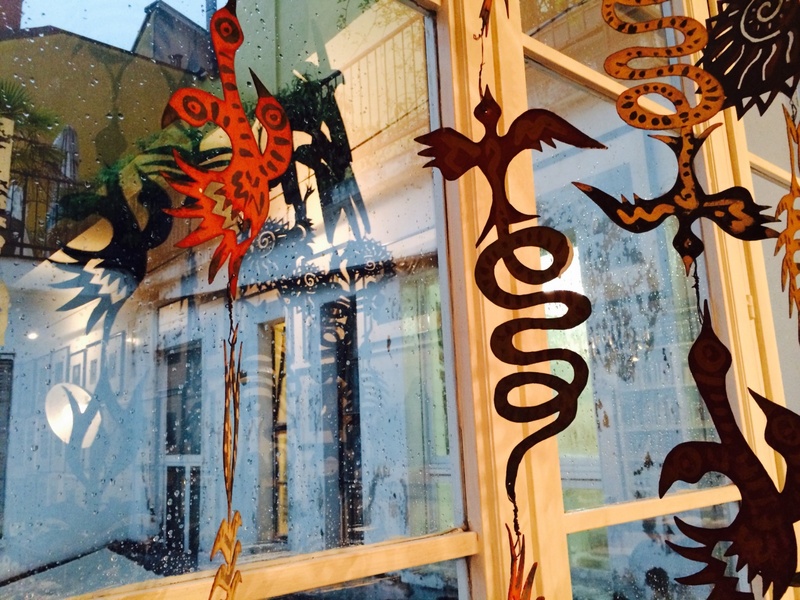 Architecture – Art – Fashion. 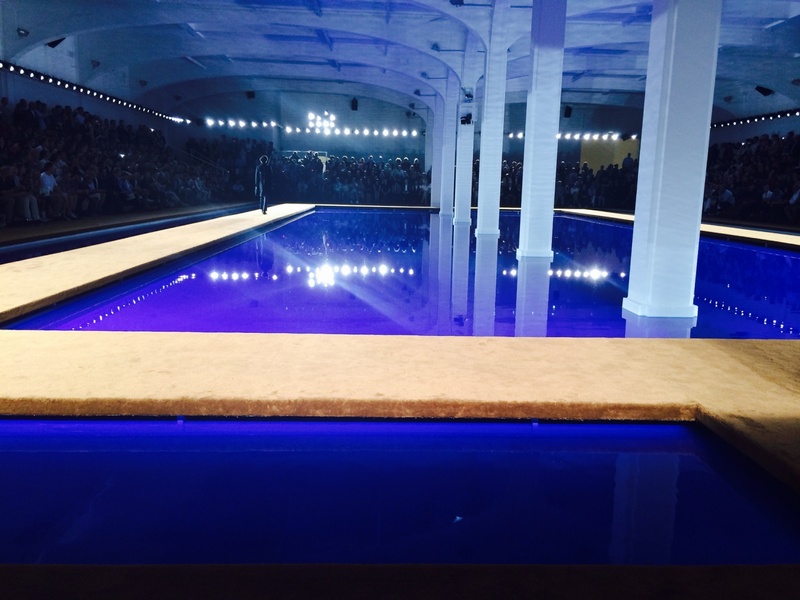 All joined in a spectacular environment of limpid blue water. So brilliantly far from the conservative, standard meaning of blue usually seen in fashion, this was a collection of elegance. 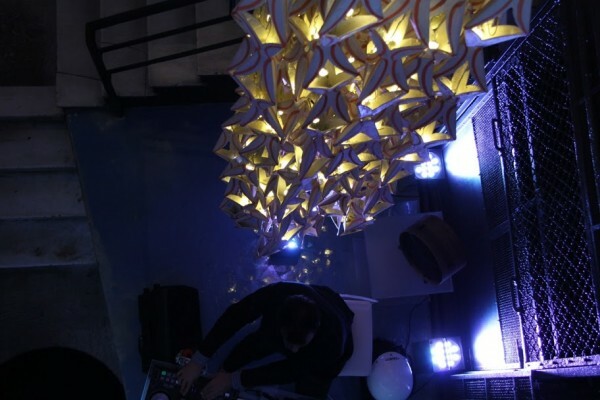 The space was an inspirational presence that gave a feeling of security and confidence throughout. The Ancient Egyptians used lapis lazuli to represent heaven. It is so pure and intense a blue that it can hold the eye for hours, seen here at the entrance of the Gallery with the Kris Ruhs’ chandelier, also an eye catcher.